The learning atmosphere in the Department of Architecture UII is based on the international standard. The quality relies on the student-staff performance and the curriculum which complies with the global-architectural student performance criteria combined with the uniqueness of the institution. The student works which mostly based on collaboration but at the same time deepen individual excellence guarantees the skills as well as the attitudes appropriate with the up-to-date architectural education. Most of the student assignments are team-work in nature to encourage leadership roles, deliberating roles, and encourage the spirit of cooperation among the students during their study and at the end of the day during their professional practice after graduation. Most of the courses in the department since the initial semesters introducing team-work based assignments including for non-studio courses such as history and theory in architecture, building science, digital architecture, and professional-related courses. 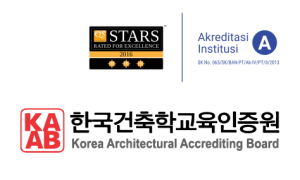 The individual excellence is tested through individual tasks, especially in Architectural Design Studios and Final Project to show the quality of individual excellence and competitiveness both at national and international level. The most comprehensive course to test individual excellence is the Final Project. As the tipping point of 4-year education (before the 1-year professional program), Final Project is expected to challenge the student to overcome the complexity of design in certain theme as their individual quality and distinction. Moreover, the nature of assignment with mixed between team-work and individual excellence is also utilized in various courses to gain more balance capabilities of the students in leadership and cooperative roles and individual competitiveness. Architecture Department offers a complete series of architectural education starting from 4-year Bachelor of Design Studies in Architecture (B.D.Arch/S.Ars), 1-year Bachelor of Professional Architect (B.P.Arch/Ar), and Master in Architecture (M.Arch/M.Ars). The 4+1 scheme is the integrated 5-year program within the department and Indonesian Institute of Architect (IAI) which graduates a professional architect prior to a fully licensed architect. This program is acknowledged by the Ministry of Education and making the department as the first institution in the country offering such scheme. The department of architecture encourages the students to be actively involved in curricular activities to develop their leadership roles during their study duration. MIMAR Student Association was established in 1989 as the official forum for the students to enhance their leadership roles and ability. Other student activities include SAKAREPE (music instruments), 7GARIT (theatre), Archiblues (band), and etc. In the university level, there is more variety of student activities unit (UKM) with more than 20 UKM. These curricular activities help to inspire and encourage creativity, self-confidence, and self-promotion for the students. Architecture Department UII is not only accredited internationally but also runs International Class (IC). IC delivers 100% courses in English. Students are trained in an international atmosphere not only by means of language usage but also by international standard resources and active in many international activities such as workshops, summer school, exchange, competitions, and seminars. Every graduate student from high school has a chance to apply to be an architecture student. Unfortunately, the entrance competitiveness is higher time to time. Recently, our ratio between the applicant and accepted student is more than 1:10. There is no differentiation between applicant from social and natural science concentrations in the high school, as long as pass the entry exam.